Tyron A.L. Hampton was born and raised in Pasadena by his parents, Denise and Tyrone Hampton. 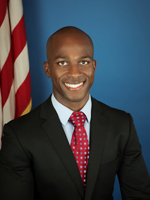 He attended Pasadena Unified School District (PUSD) schools located in District 1 during his academic career: Cleveland Elementary, Washington Middle School and John Muir High School. While he was in high school, he supplemented his education with additional college courses at Pasadena City College. Upon graduating from high school in 2001, he began his college education at the California State Polytechnic University, Pomona where he earned Bachelor degrees in Food Marketing and Agriculture Biology. 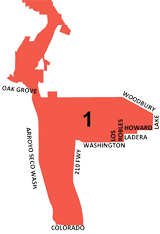 District 1 is bounded by Oak Grove, the Arroyo Seco Channel, Colorado, the 210 Freeway, Washington, Los Robles, Ladera, Howard, Lake, Woodbury and Yucca.